Blog » Ready, set, float! I was a little skeptical about entering the sensory deprivation tank. All I could think about was the walls closing in on me and drowning in a bunch of salt water. You have to be in there for 90 minutes. 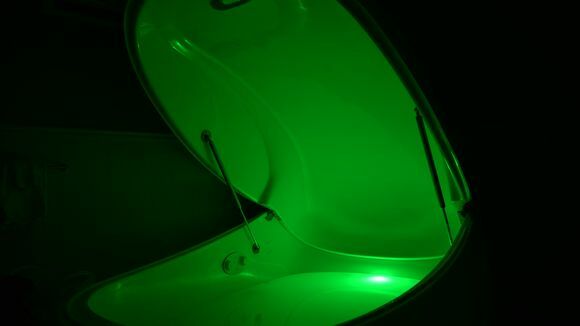 I can’t remember the last time I sat still for 90 minutes, let alone floating in a weird tank with no noise or light. Reporter Laura Peters goes into a sensory deprivation tank and recalls her experience. 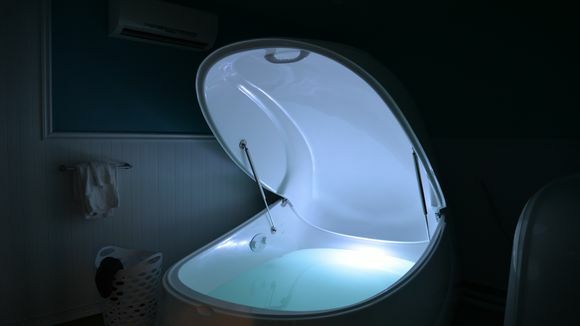 Sensory deprivation tanks are these giant shell-like capsules you can float in. They have about a foot of water in them and 850 pounds of Epsom salt to make it easy for your body to float without even trying. You’re completely weightless. It feels like you’re in space. I decided to make the plunge to go along with my whole healthier lifestyle and to find a way to unwind from my life’s daily stresses. There’s a sensory deprivation tank facility in Charlottesville called Aqua Float which has four tanks available. Sensory deprivation tanks, or float tanks as they are called, are supposed to help with a number of things like joint pain and stress. Meditation is also a really good thing to do, not only for health reasons, but for your sanity. These tanks basically force you into a meditative state. a foot of water and 850 pounds of Epsom salt to allow the body to float effortlessly. The problem with me is, I can’t slow down. I’m constantly thinking of deadlines, what I’m going to write next or how long I have to do something. My entire life is run by structure, so letting go and just spending time on either me or the silence that could surround me is a very frightening thing. In a float tank everything shuts down. When that door closes, it’s silence. And when you shut off the light, it’s complete darkness. The only thing you can hear is your breath and the sound of your heart beating in your chest. I was worried it would feel tomb-like. I’m extremely claustrophobic and the thought of being enclosed in something is absolutely terrifying. The tank is actually quite large. I could spread my arms out wide and my fingers would just graze the edge of the tank. So, space wasn’t an issue. It was like a large bed of water. The water is also heated to around 93.7 degrees and stays that way the entire time you float. You can choose to keep the lights on. They’re nice and the change colors from blue to red to green to white and so on. That can also be a distraction, at least I thought so. After I had got myself situated — it’s hard to get the floating thing down a little, and you have to work on staying still so you don’t run into the walls of the tank and you have to find a comfortable position — I turned the lights off. That was probably the hardest thing to do. Maybe I’ve seen too many Final Destination movies or read too many urban legends. I constantly thought of all the weird ways I could die in this situation. I combated my fear with breathing and finding a way to center myself. I have done a lot of yoga in my life, so this was like entering savasana at the end of the practice. Savasana is the position at the end of yoga where you literally just lay there and unwind. I tried to enter that place. The cool thing was it was possible to do. Unlike in yoga, there were no outside noises bothering me, it was just me. With a yoga class other people are making noises, or if you’re at a gym you hear all the weights moving or other class participants sneaking out and opening the door. That stuff really messes with your whole vibe. Before I knew it, it was over. I really don’t know how the time went by so fast. It really only felt like an hour, tops. You shower off in the room, get changed and go on with your day. I do have to say I felt completely relaxed afterwards. I was talking quietly, moving around in a calm fashion and my joints felt better. My knees have been hurting a lot lately with all my CrossFit workouts and pressure. After the tank, they were fine. I guess spending some time in the tank not putting any pressure on them was just what I needed. I think if I try it again — and there’s a good chance I will — I will be able to calm myself down faster. I know what to expect now and I’m not worried about a deadline. I just need to breathe and let the world slip away for awhile, and I suggest everyone does at least that.